I would like to thank the members of Aidoru Sozai for taking part in this e-mail based interview with me, and for allowing me to publish their answers on this blog. Though the group is still fresh, they are raring to go and show us what they are made of, and to allow us to understand the group and its members more through this interview. 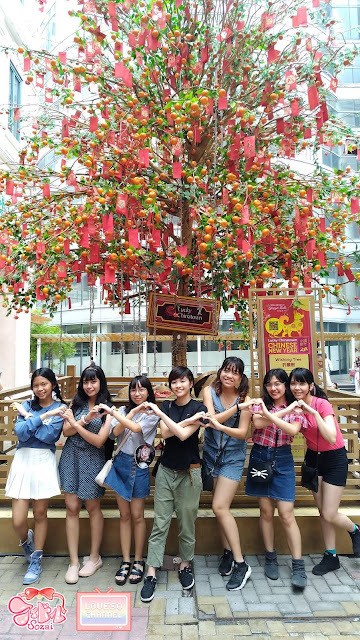 Formed in the early months of 2018, Aidoru Sozai is a 7-member self-produced idol group based in the Philippines who are currently undergoing their indies phase. Made up of former MNL48 candidates, this personality-filled lineup have already held their first successful mini-live on April 28th at Ozine Fest 2018. Currently, the group are working towards a debut single, but have successfully introduced their own overture that will accompany future live performances. Despite being so new to the idol scene however, fans have taken to Aidoru Sozai - LoveSo for short - and are excited for the beginnings of this groups bright and inspiring journey. - You are a self-produced Idol group based in the Philippines, which is pretty amazing. What talent does each member bring to the group to make it what it is? Each member has their own share of work related to managing the group. Someone handles bookkeeping and finances, someone handles the posts, graphics, writing, we have artists, musicians, dancers, etc. Everyone contributes a little bit of something in almost every aspect. - Your following is growing already, especially online. Can you tell me what your aim is now that you’re recognised as an Indie Idol group? Mika: We think that we have a long way to go before we can truly prove ourselves as an ‘indie idol group’. People have heard of indie bands, usually comprised of adults and people that can pool funds, but not ‘idols’ with a younger age range, most especially J-Idol style groups. We would really like to be taken seriously, since it really isn't just a form of leisure for us. Our current aim is to just keep improving ourselves to give people a good performance and show them that their support was not in vain. - What concept does Aidoru Sozai follow? Are you cute, cool, or maybe something else? Mika: We don’t really have a set concept! We actually want to try out different types. Everyone is different but we think we come together to form a pretty balanced team. Vivi: Currently, we're following the orthodox, cutesy idol concept (since it is unheard of in the Philippines). - You’ve all been inspired by Japanese Idols and music, so I would like to know: Which Idol inspires you the most, and why? Aira: Arashi. They inspire me through their shows and stages. Arashi wouldn't be close to where they are right now if they hadn't visualized it. It’s all because of their strong bond, hard work and patience. Like them, I also want to be someone’s strength and inspiration. I want the group to have a strong bond like them. Jash: I first discovered J-pop when I was around 9 or 10? Maybe earlier. Although I used to listen to BOA back then, Koharu Kusumi was my first favourite idol and then I started to like other Hello! Project groups as well. I love Morning Musume! Watching them perform live makes me happy and seeing how the audience dance to their songs makes me want to perform on stage. I've always loved the stage. Vivi: Fujitsuka Reia! She pulled me in to liking underground idols, and she always does her best (even though she clearly knows only a few people follow her) and makes her fans happy by doing what makes herself happy! I want to do the same, except I aim to influence more people than her! Yana: Not really an idol but a V-kei Band. SuG has always been that group that always makes me feel supported when I hear their songs. Their songs have always cheered me up through every darkness that I have encountered ever since I was 14, so I feel like they are always just beside me. They always lifted my feelings whenever their songs came up on my playlist. Just like them, I want to inspire and cheer up people through everything. Mika: Watanabe Mayu. She’s not the first idol I discovered but I love her because in her I saw a faint reflection of my ideal self at the time. When I found her, it was a time where I and my friends were often made fun of for liking anime, games and anything related to Japan, and often the impression was that kids who were otakus or bookworms were ‘unattractive’ or not charming at all. Mayuyu is totally the cyborg idol that appeals to akiba culture, which kind of shocked me because I wondered how a girl could be that cute and talented while also being so into those kinds of things. She never tried to change herself in order to be liked and did so in a positive way. I felt like even I could have a chance to improve myself in many aspects in that sense, and that I shouldn't settle for the stereotype that people seemed to impose on me just because of my interests. TLDR; I can say that I am inspired by all idols, since they all have their success stories no matter how big or small it is. - And out of your fellow Aidoru Sozai members, who do you look up to the most? Mika: Vivi. I think her mental maturity precedes her age. She’s very clever and responsible, I wish I was like that when I was younger. (Hahahaha!) I also noticed she learns dance steps really quickly. Aira: I look up to Jash!! She’s really funny and classy at the same time. Vivi: I look up to my personal holy trinity oshimen; Mika, Saachan, and Yana! They’ve all been through a lot, yet they do their absolute best to stand strong and cheerful. That’s something I have a hard time doing, so to see someone being able to do that will gain a lot of respect from me. Jash: I honestly think that everyone in the group has something in them that could be an inspiration to me. Yana: No one, because I am the tallest. Kidding aside, I think everyone has different abilities and skills to be looked up to. Hayayan: Saachan! Since I met her for the first time, I already felt an idol aura from her. Even when she just came from school and we were talking in McDonald's, I felt like 'I am talking to a famous idol'. - If you were not a part of Aidoru Sozai, what do you think you would be doing now? Jash: Maybe I would still be studying? I mean, just studying. I don't do other activities aside from school. I just go to school and go home after that. It's a little hard to think about these things because I still do not know what I want to do in the future aside from performing. It's the only thing I'm sure of right now. Aira: I’d still be that senior high school student who loves to listen to J-pop and watch J-drama's. Nothing would really change because I live a pretty normal life! Though I think I’d immerse myself more in theatre and other school activities. Mika: I’m honestly not so sure. There could’ve been so many paths. Vivi: I would find other ways to be an idol. Realistically, I would start uploading utattemita and odottemita videos to gain a little bit of popularity, and then I would start my idol journey from there. Yana: I would probably be having a part-time job at the US Embassy along with my friends. Kidding aside, I’d probably continue joining karaoke contests, just to fulfil that distant dream through singing. I really love singing and performing on stage. Hayayan: I think I’d still be a ghost character. Maybe I would have finished watching My Hero Academia and other animes that I was planning to watch already. - What do you think you can improve on now that you are an Idol? Aira: Being an idol is a challenge for me because I don’t have any dancing skills. Recently, I think I’m getting better! I’m thankful to the members for being patient with me. Jash: I wish to improve my social and communication skills. I am scared of public speaking, especially if it's an impromptu. It's also good to know how to react to what other people say because sometimes people would think of me as a cold person because I would reply with short answers, or I would just smile and laugh. I want to be better for those who support me. Vivi: I need to practice my singing a lot! I’ve been singing at karaoke for a year now, but I feel like there’s only a small improvement. I need to practice a lot if I don’t want to disappoint LoveSo’s fans! Mika: Its still strange to be told that I *am* an idol. I suppose the main thing is self-confidence - I have a pretty self-deprecating mentality. I can improve my performance skills all I want but the heart at the core of everything is always going to show. I’ve also been told that my face seems very cold or emotionless, so I have to work on my expressions. Also, my physical health is more important than ever. Yana: Aaa- Just like Mika, It still feels weird to be called an *idol*. It makes my think that I really am reaching it. Hm, I want to improve everything about me! Even though Saachan kept on saying that I am already good at dancing, I still want to be better! Right now, I am not satisfied with myself and I feel like I am still not enough, that’s why I want to improve everything! Saachan: I want to improve on my dancing skills! I’m not really good at learning a dance by myself and learning a new choreography makes my head hurt... I don’t know, maybe I’m just too lazy to learn and tend to wait for someone to teach the steps for me (lol). On the rare occasions that I’m not too lazy to learn a dance by myself, I try to draw the movements to make memorization easier for me. I want to be a dancer that's a fast learner someday (lol). - Do you have a charm point? Please let everyone know. Jash: People say it's my smile and how my eyes smile as well when I laugh, even though I have a gummy smile and big eyebags. Aira: Ehhh... I think it’s my height and small voice! Vivi: I think it’s my cheerfulness, my annoying voice, and my eyes! Mika: Dunno. Maybe my speaking ability? Also apparently when I’m idle, I give off an intimidating or cold vibe, so people who meet me properly for the first time get surprised that I’m actually ‘not so scary’. Yana: I honestly don’t know as well... Hm, maybe being a ball of energy? And oh! Hayayan kept telling me that my lips are just like a cat’s! - What is your personal aim as an Idol? Mika: I just want to be able to make someone feel that they should not give up. I can’t speak for everyone, but I know what it feels like to be on the edge - lonely, depressed, you name it. I hope that by running after my dream no matter what, someone out there feels like they can do the same thing even with smaller goals. My ultimate goal would be to have someone feel that there is someone there. If I have moved someone’s heart to do something good for themselves or for others in some way, even if it’s just something as simple as waking up on time in the morning, I am satisfied. Jash: I want to be an idol performing on a big stage with a bright view of people singing along to our songs. Although it doesn’t matter if we get to perform on the biggest stage here in the Philippines. With the number of people supporting us right now, I am happy and proud of the members and the people who support us. I want people to know that our dreams are always waiting for us no matter how long it will take us to get there. Back then, other people have looked down on my dream saying that I would never be an idol, but I am turning into one right now. I'm not saying this as (way of) revenge but for those people to see that it is never impossible and maybe when they see me as an idol, they would follow their dreams just like I did. Aira: I want to reach a lot of people. For some, our fanbase now may be small. Still, I’m very much overwhelmed by the support we’re receiving. Isn’t it amazing to be a part of someone’s life? I always thought that being an idol is only a far away dream I’ll never reach. But now, I want show everyone that anything is possible with hard work. Vivi: I want to make people believe that the idol concept is possible in the Philippines. The concept of a group of teenage girls close to you, reaching out to your heart as they reach for their dreams, is possible in the Philippines! Yana: I have always wanted to see people smile for me. I have always wanted to reach out people, inspire and cheer them up with our songs. I want those people, even those who don’t know the idol concept yet, to see us as a group who can inspire, bring happiness and be looked up to. Aside from that, I want to spread the idol culture here in the Philippines along with my treasured members! Saachan: To bring idol culture into the mainstream! I want J-pop/idol music to be appreciated here in Philippines as it is in Thailand! Thailand is a good comparison since both are in the South East Asia region, and I know how great the idol culture is there. I want to be an idol that will be known among people in and out of the Philippines. With Aidoru Sozai, I want to be in the same level as popular idol groups when it comes to quality and content. I also want to sing theme songs for shoujo and mahou shoujo animes! Hehe~ I have a lot of things I want to aim for as an idol, but I’m already thankful with whatever and wherever this dream is taking us. Hayayan: I want people to believe that even if you don't have any talent and you feel like you're always useless and dependant on others, you have something that you can do, and someday, you'll find a way to be helpful. That's why I hope this is my way to be helpful and to pay back all of the happiness i received from others. - When someone says the word ‘Idol’, what is the first thing you think of? Aira: Aside from the cute smiles and sparkling eyes that idols possess, it’s their passion that I see the most. Jash: The first thing I could think of is the aspiration. Being an idol isn't easy and dreaming of becoming one is never easy. Even so, what brought me here is my hope of achieving this dream. We're still starting so it won't be easy, but this is already a big step for all of us since we never expected to become idols this way. Vivi: Unsurprisingly, the first image that pops into my mind is Maeda Atsuko. An idol is someone who can influence people positively by simply making his/her dreams come true. Mika: The power of emotion and the strange beauty that imperfect things possess. Yana: A hotdog brand. Specifically, a cheesedog. - Is there a member in Aidoru Sozai you are curious about? Jash: Maybe Hayayan? She's still nervous and shy when singing. Although she always tells us that she has no talent, I feel like after some time, she would surprise us with her performance. Mika: I’m honestly still curious about everyone. Vivi: Hayaka, Aira, and Jash. Before Aidoru Sozai, I rarely talked to them (though I did want to be friends with them!). Now that we’re here, I want to discover who they are and to form strong bonds with them! - Which member is the most mysterious, and who is the most open? Jash: I don't think of anyone in the group as mysterious. Just girls who are yet to improve and surprise people with their improvements when the time comes. We are all open to our ideas and issues about stuff but for me, Saachan is the most open person. We have this bond even if we don't talk that much everyday. Aira: Everyone is open to each other! I find Mika as the most mysterious member (hehe). Vivi: Saachan is definitely the most open! She voices her opinion a lot, which I admire. I find Hayaka the most mysterious, because she’s rarely online and I don’t know what she does in her free time! Mika: I think everyone can be pretty mysterious sometimes, but most of us have warmed up to each other somewhat to the point where we start doing the stupidest things sometimes (HAHA) so it’s hard to say. Yana: Saachan is no doubt the most open member. I don’t find anyone mysterious. The open person is Saachan. She will be savage towards you even IF you just met her a day ago. She treated me as a friend already, as if we were already friends before. - As you are currently planning your debut release, can you tell us a little about the song, and what we should anticipate from the release? Jash: When I wrote the song, the first thing that came into my mind was that this song would carry all our dreams to the stage. I wanted everyone to feel the connection between the members and the lyrics. It’s something I worked hard on and I hope people would like it. Aira: I cried when I heard the final mix of our first original song. Vivi: The song is a story of how we were going to reach our dreams, despite all the problems we’ve encountered. It’s the story of Aidoru Sozai. Mika: I think the lyrics can apply to anyone and is easy to listen to. The song kind of sounds like us, if that makes any sense? Yana: Please anticipate how Saachan will transform into a train. Hayayan: When I heard the song for the first time, I went ''omg, it's a legit song''. I was surprised because it's not from a professional songwriter, but the lyrics are good and the digital skill is good. Jash is so talented!!! This song encourages people who are trying to fulfil their dreams. - Also, what style of songs would you like to try to sing in Aidoru Sozai? I would love to hear a cute, fairy tale themed song from you. Mika: We often talk about different types of songs that we want to do, we send video links to each other and think about the possibilities. Of course we’d like to try a cute, orthodox idol song. We also want to do something cool or tough. Aira: I want to sing cute ballad songs accompanied by piano or acoustic guitar. Vivi: After singing cutesy idol songs, I would want to go with cool and upbeat songs, since I’ve always wanted to dance difficult choreography with a group! Yana: I would love to sing cool and strong songs! Hayayan: Something that is from us and not copied. Saachan: DEMPA MUSIC!!!! OMOOMOMOMOMOMG something like that of nijicon, dempagumi.inc, cy8er etc’s music.. I also want to do catchy songs that make no sense like some of Wasuta’s songs!! - Is there a stage in the Philippines or another country that you would like to stand on with Aidoru Sozai? Aira: AFA Singapore and the dream stage: TIF. Vivi: Since I first discovered idols by watching a idol performance video that was shot at Harajuku Strobe Cafe, I want to perform there with Aidoru Sozai to show them how thankful I am for the cafe’s existence. But other than that, I’ve always wanted to watch performances at Tokyo Idol Festival, and maybe do our own performance there wouldn’t be so bad! Mika: Cosplay Mania’s JAM stage as an opening act or something, TIF (in Bangkok or Japan), anywhere, really! I’d be overwhelmed enough to think about being able to perform in front of an overseas audience. Yana: Tokyo Idol Festival has always been a dream stage of mine. I would also love to perform on Japan Expo at France!! Aside from those, I appreciate any stage that would be given to us, for us to perform. - What is it about Aidoru Sozai that will interest people in becoming fans? Personally, I think your cute members and charming auras are a good reason to follow you! Mika: Each of us really loves idols and started out as a fan, so it might feel easier for some people to connect with us because we’d probably fawn over the same fanbases. Also, we’re all into very different fields and interests so there’s something to relate to for everyone. Vivi: People know we all love idols, so we have an idea of what the fanbase wants to see from us. The fans, knowing that we are the same, would follow us for that. We have a connection with them. Hayayan: Each member has a different character and has their own talent. The most important thing is that we share the same dream. - And now for some fun questions! If Aidoru Sozai entered a Fairy Tale world, which character would you become? Mika: I know this isn’t a fairy tale, but I want to be a Gundam pilot. Please. Jash: Maybe just a simple girl with cute wings who makes sweets? Kinda like the sweets spirit from Yumeiro Patissiere. Yana: Not from a fairy tale, but I want to be Mulan! I want to get down to business, to defeat the huns. Hayaka: A Prince of course!! ... Who went to the princess after her step mother killed her and just kissed her corpse, acted like he's the hero who saved her but actually the dwarfs are the one took care of her and tried to save her until the end. - If you could travel anywhere in the world, where would you like to go? Mika: Germany - I want to see castles and gothic architecture. Also BNK48’s theatre when it opens! Aira: Of course, Japan! Also Australia, because I think it’s easy to live there. Vivi: Harajuku Strobe Cafe in Japan, that was where my favorite idol group, meltia, had their first live. I want to reminisce on the time when they were still a group, performing with all their heart! Yana: Japan and any European Countries! Saachan: Japan to go on a lot of idol lives, and of course to pig out on Japanese food and sweets!!! South Korea for the food, US for the food... I just want to try out food from all over the world. - Which animal do you think you are most like? Jash: Ah~ I’m not really sure. Maybe a dog? I’ve never thought of it. Vivi: An ant! I may seem insignificant to the world since my job is small, but without me and my fellow ants, all plants will die! Mika: A bear. I sleep a lot and look intimidating but I’m pretty harmless. Yana: A panda. Aside from the eyebags, I usually just lay down and do nothing. Saachan: A sloth. Enough said. - If you were caught in a rainstorm, what is the first thing you would do? Jash: Look for a safe place to stay? Vivi: Dance in the rain! Dance Futari Saison or Garasu wo Ware! Enjoy the rain! Yana: If I don’t have anything with me, I will just probably stop walking and enjoy the raindrops falling above my head and stare at the sky. I used to do that when I was a kid. Hayaka: I'll try to fly with my umbrella like Sakamoto-san. - Is there a motto, quote or saying you live by? Please tell us! Jash: I just saw this one time on Facebook, although I do not know who said it. It says that "What's ahead will always be more than what's behind." Mika: There’s no particular line, but the manga Boku no Hero Academia really inspires me. When All Might told Deku “You can be a hero”. Sometimes, all a person really needs is to hear that someone believes they *can*. I think that line made him take the leap to become a hero more than simply being given the superpower alone. Hayayan: "Buta mo odaterya ki ni noboru''. This is in Japanese but in English, 'Even a pig will climb up a tree when flattered'. - If you had one wish, what would you wish for? Jash: That there would be no place for sadness in each of our lives. Vivi: A world with no hate. Mika: I wish I could talk to my mom. Saachan: To fulfill my dreams and have a successful career. Hayayan: To have the magical power to make all food low calorie but still have the same taste. - Finally, a word to your fans, the readers and future listeners! Please express everything in your heart right here. Mika: Please love Aidoru Sozai for many more years to come. Thank you for being with us and for believing in us. We’ll work hard to become people worthy of being on the stage you gave us. Hayayan: I might be not special or talented, but I hope I can become someone who can encourage and make you happy even in a simple way. Thank you for letting me stand on the stage. Saachan: I always have a hard time when it comes to explaining my seriousness in this idol thing... Nevertheless, please look out for us!!! Please put Aidoru Sozai in your care! - Thank you for joining me, and for answering all these questions! It has been a pleasure meeting with and getting to know you all. I wish you all the best of luck in your future endeavours as Aidoru Sozai! As a long time reader of this blog I know that if Chiima asks what fairy tale character you would choose to be there is only one correct answer. Chiima is a sucker for Cinderella! This leads me to believe Vivi is very smart indeed and really did her homework on Chiima and O!MT before the interview. But in all seriousness, I'm impressed with how smart they all sound. With their combined intellect, a good measure of talent, a strong work ethic and a pinch of luck there is no reason this group couldn't meet and exceed their goals. I feel like LoveSo are going to be a charming group, one we should really look out for in the future! Such dedicated girls, all with different quirks and personalities, and yes, they should exceed their goals! I hope they do!